Today is my 10th wedding anniversary and I wanted to make this today and I did it. I made a very little quantity as I was not very sure whether my husband and kids like to taste. But they did. Here goes the recipe. I bet most of you know how to get coconut milk from fresh coconut. For those who have no idea about taking coconut milk, here is how I took. Take those coconut pieces in a mixie jar. Add couple of teaspoon of water and grind it into a fine paste. Using a strainer, just squeeze the milk which you get from the coconut paste. This is the first milk. Now add 1/4 cup (enough for 1/3 cup coconut pieces) water to it and grind the coconut residue again. Follow the same process and get the second milk. Again add 3/4 cup of water to the coconut residue and grind it for the third time to get the third milk. Keep the three milk separately. In the mean time, dry roast moong dhall till it becomes pink color. Wash it along with the raw rice and pressure cook it with the third coconut milk. 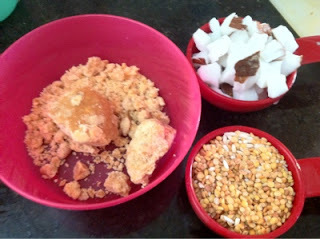 Melt the jaggery in water and strain it to remove dirt. 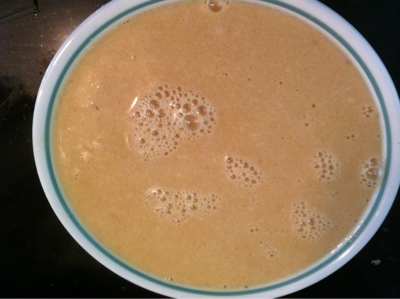 Take a heavy bottomed pan, add the jaggery water and bring it to boil. To this add the cooked rice & dhall mix and let it cook. When it started reducing, add the second Coconut milk to it and let it boil. When it starts thickening, add ghee to it and mix it well. Remove it from the flame and add the First Coconut Milk to it. After adding the first milk, Pradhaman should not boil. Pradhaman is ready. Enjoy! Irresistible pradhaman, wish i get a glass.